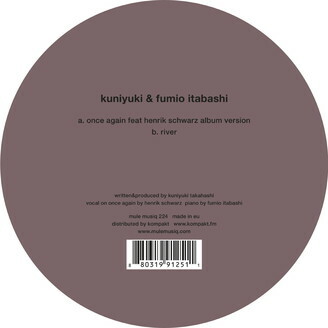 the first collaboration of kuniyuki and japanese legendary jazz pianist fumio itabashi, it’s originally released in 2009,recorded for kuniyuki’s third album “walking in the naked city”. kuniyuki and itabashi invited henrik schwarz as vocalist,maybe you remember henrik&kuniyuki’s house version. itabashi said river is one of the best song which i have produced.